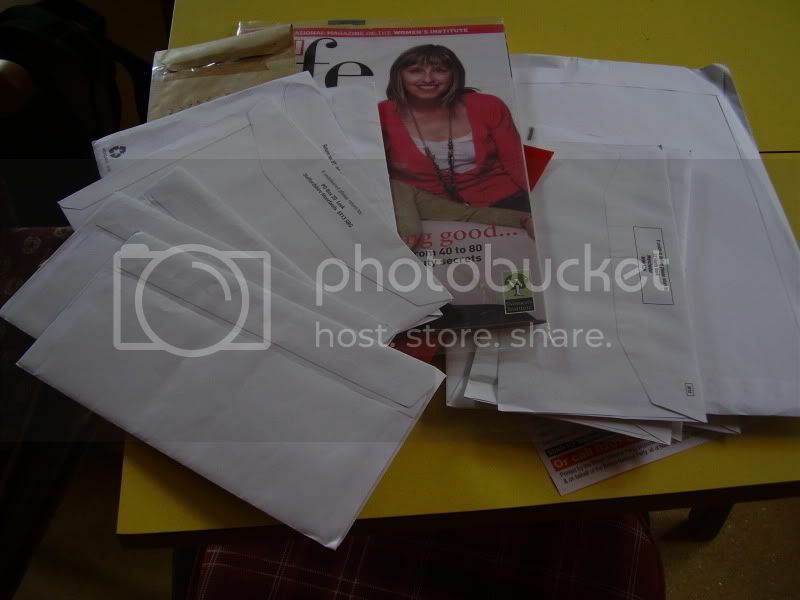 Stop junk mail with junk buster – Your choice! Or is it? Last week I was contacted by Robert; webmaster of Stop Junk Mail and creator of the fabulous Junkbuster programme. Robert set up his website “Stop Junk Mail” after being appalled by the amount of junk mail generated in the UK. Earlier this year, he unveiled Junkbuster; which we reviewed on the site. Junkbuster is a simple online form, allowing you to opt out of yellow pages, junk mail and catalogue databases all at the same time. In less than 30 seconds, you can be reducing your junk mail by over 10kgs a year. That’s the most effective diet ever! Sounds brilliant, right? We know you love it, because over 3,000 people have used his application, resulting in over 24,000 kilos of junk mail being saved from its fate. The Direct Marketing Association (DMA) have started ‘capturing’ all e-mails sent via Junk Buster to the Mail Preference Service (MPS) and Your Choice schemes. The DMA is unhappy about the information about reducing junk mail on Robert’s websites. The DMA want Robert to tell the public that ‘turning off the tap’ may result in missing all sorts of fantastic unsolicited offers and argues that the e-mails send to the DMA’s opt-out services are essentially opt-out requests (and they don’t accept third party requests). As Robert says, the latter is nonsense. The e-mails explicitly say that the sender is thinking about registering and asks the DMA to send out an ‘information pack and opt-out form’. In other words, Junk Buster merely makes it easier for people to contact the DMA’s opt-out schemes. It doesn’t ask them to register the sender with the opt-out schemes and the DMA gets every opportunity to explain to people how fantastic junk mail really is. Yet, the DMA simply refuse to acknowledge that ‘contacting’ and ‘registering’ are separate things. The full correspondence is on Robert’s Stop Junk mail blog. Be warned; you may need a good hour to read through it all! What do you think? How can we help Robert, ourselves and the environment with this junk mail issue? Junk Mail is classic Chain of Waste with an endless supply of waste, plastic windows in particular, coming from now to eternity. Reducing this mountain is very worthwhile. Robert’s catalogue campaign is one aspect I have not looked at so far but seems an important issue. Like Zero Waste, there are always new challenges in the waste reduction effort. I signed up for this when seeing the link on here as my previous opt out had lapsed. The only other thing I do now if I do get anything that can be returned is write across it RETURN TO SENDER and pop it back into the post. As I said previously, I did sign up with Junkbusters, but this is the 3rd time I have said NO to Yellow Pages, but still they magically appear on my doorstep. This year we were fortunate that Master P’s school joined the Yellow Woods campaign and have gleefully been accepting every copy we can get our hands on. By collecting from friends and neighbours (and the odd obviously abandoned copy), we have personally taken about 25 to school and as of last Friday, they were running 3rd among the local schools. We managed to find an extra 3 copies to take in and hopefully others had a last hunt around too as today is the last day they are accepting them. One thing of note, was that the majority of the books being recycled in this way were this years additions! What a waste of resources! I did firstly think that this was down to younger generations using the internet, but when I spoke with an elderley couple, they said that they didn’t need one because they already had their network of people to do jobs for them, so they were very unlikely to need to plough their way through Yellow Pages. My goodness. DMA, feel threatened much you poor little petals ?!? What a pathetic attempt to pretend that contact and registering are the same thing for their own blinkered selfish purposes. As for the ” no third party ” thing, what utter BS. I was able to register for the mailing preference service online for a deceased tenant 2 months ago, no problem, there are fields for it on the form and everything- so what’s your excuse DMA ? . I appreciate Junkbusters is a contact service but o how useful it would be to be able to use it properly ( without all that blockage nonsense ) for someone in my situation – not only personally but professionally. My weekday job is running a sheltered housing scheme and I currently have 3 flats empty, 2 tnts passed away and one relocated. This generates, despite my best efforts with delivery personnel, a huge amount of junk mail & leaflets each week. I have to make daily visits to the Post office and recycling to get rid of it, amounting to almost two hours a week of a precious 20 hours on duty. That’s time I should be spending looking after my tenants, not getting rid of unwanted eco unfriendly crud ! Oh dear! Just watched another dejected looking leafleter walk back up my path after reading the note on the door! Shucks! Do these people not realise the more crud comes through our door, the less likely we are to buy or even take notice of what they are selling ? so it is counter productive to their aims ! also, despite me adding them onto the mailing preference lists, still more junk mail than ever arrives for the deceased tenants… for pete’s sake, you are trying to sell stuff to DEAD PEOPLE you idiots… grrr !!! @greenlady42: Whoa! that’s a big pile ‘a junk there greenlady. Since learning more about the process of paper manufacturing, I got to realise that it’s a very energy expensive product. Recycled paper is NO better either. We may think it’s a nice biodegradable item, but it used a whole lot of oil in the manufacturing process (running machinery). So junk mail is very, … very eco-destructive. It serves no purpose, except to use up trees, consume energy and oil, produce pollution in the manufacturing, only to create anoyance and yet more waste at its final destination! The DMA are protesting about receiving details from a 3rd party. Disputable or not, it’s certainly an ironic reason! Well, something useful might have turned up from it all. I didn’t realise about the section 11 request to stop companies sending me advertising materials. Hopefully I can use that to stop me from receiving advertising from a few companies who regularly post things I don’t want. Aside from junk mailers, some of the requests will also be to businesses I do buy things from. I often shop with one company, but I never use their paper catalogue that they just send. I always look on their web site and order online to save time and postage stamps. I’m sure some people do appreciate and use the catalogues, but I just don’t. Oooh, the whole thread made me so ANGRY!! I read all of Robert’s blog, commented too. I’ve contacted and registered with MPS direct, mentioning that I’d heard about them through Junkbuster. It seems that MPS is the site to go through, because the only DMS site I could find, had no opt out scheme visible anywhere on the site. Interesting that they do have fields for reporting deaths; if that’s not third party I’m not sure what is. Sounds like we need another third party, a medium then, so that they can do it themselves! Hi John, I’m glad we can find something even you have not looked at yet! How did you get on with junkbuster? This week it has been 6 leaflets from different political parties trying to get our vote – all on glossy paper and pushed through the door. Poppy, our Yellow Pages was delivered too. It was very frustrating and like you, I’m appalled at the waste of resources. Interesting about the response from your elderly friends. Well done on your collection for the school campaign though; that’s a great total – you must have strong muscles now as well! Greenlady; thanks for airing your annoyance about this issue. I was astounded to see you spend one tenth of your working week sorting this out – what a sheer waste of time, energy and trees. I hope things get easier for you. Thanks for sharing your photo too; it helps to highlight this issue. Hi Ben, glad you found something useful in this. I’m like you – I always send paper catalogues back to the company with a note asking to remove me from their database and that I will be using their website if I want to order in the future. You’d think they would be pleased to save the money on the one hand, but on the other; ‘reminding’ you of their existence is a subtle form of marketing. @Mrs Green: Mrs Green, I emailed Robert for some feedback on RTS and look forward to his ideas. With my focus on plastic waste, mail is less pressing, save for window envelopes. The DMA attitude is all wrong but they may benefit from RTS, who knows!